Runners need to eat well in order to perform, and what they eat can have a direct influence on how they run. The Runner's World Cookbook is the perfect combination of performance-boosting nutrients to maximize performance with easy, delicious, and quick recipes. 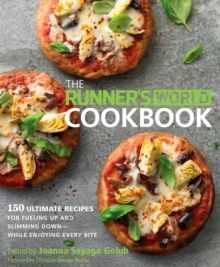 This cookbook contains 150 recipes sourced primarily from the authoritative voice in running itself, Runner's World magazine, along with exciting additional content. These recipes are intended to maximize a runner's performance and enhance nutritional benefits. The book will include two recipe indexes with visual keys for classification at the start of each recipe, with V (for vegetarian), VE (for vegan), GF (for gluten free), and more. The first section of the book focuses on nutritional information and staple ingredients every runner should know, and the second part of the cookbook illustrates how to turn these facts into delicious, quick, and nutrient-boosting meals through delectable recipes. Every recipe will have an easy-to-follow icon system to identify key recipe attributes (i.e., recovery friendly; low-calorie; quick and easy), along with a nutrition guide that will offer readers tips on how to make the healthiest choices regarding that particular category of food. Divided by categories (Salads/Soups/Stews, Sandwiches/Wraps/Burgers, Pizza/Pasta, etc. ), these recipes are presented by types of dishes runner can look to for satisfying performance needs in appetizing ways.